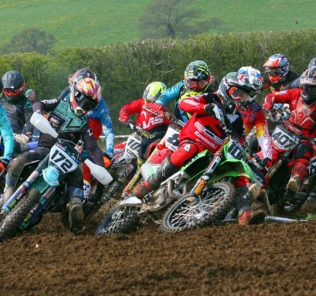 It was all roads leading to Brookthorpe for the first round of the South West Motocross Clubs champs which attracted a great entry of over 200 riders. In the Auto’s it was Elliott Mason who made a storming start to his club champs taking the overall with two race wins from Moto 1 victor Bobby Farmer. Freddie Richards rode well all day long for third. Fresh from his podium visits in the Arenacross tour Isaac Ash showed he is well at home racing indoors and outdoors and rode superb with three race wins and a visit to the top step of the podium. Kenzie Cole and Danny Flude battled it out for the runners up spot, but it was Cole who had the edge and took second. Ben Sullivan looked sharp in the Small Wheel 85’s and gained the top spot from York Coleman and Jake Brown. In the Big Wheel 85’s Ben Zeale raced to two determined moto wins for the overall from William Rowe and race 1 winner Henry Life. Ryan Tanner put a race one fourth behind him to fire home double moto wins in the second and third races for the overall with Efan Loring just getting the better of Zach Cooper for the runners up spot. Cameron Jackson started the day with the race one chequers but couldn’t follow it up and finished fifth overall. Jamie Deadman pulled off the victory in the Vets class over Simon Molter in second, and David Cooper third. In the Novices Elliot Woodward rode like a trooper notching up all three moto wins for the overall ahead of Tom Ford and Ben Martin. Such was the demand in the Novice class there was also an overflow race with Bryn Brookes running out three wins. Jack Timms was a class act in the MX2 adult class posting a 1-1-1 scorecard, with Tyrone Cleaver following him home on each occasion for 2nd and Harry Pritchard taking home a hattrick of thirds for the number 3 spot. 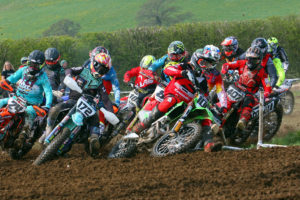 George Purchase enjoyed his Brookthorpe visit and carded an immaculate three-race win maximum in the Adult MX1 class, with Bradley Maddever second and Scott Ardren third. The club now moves onto Littlehempston this Sunday 14th April for the next instalment of their club championship.